This property is part of the Estepona Apartments. 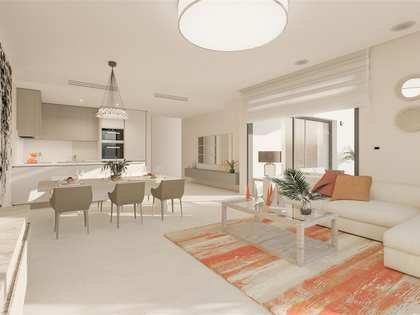 Exceptional luxury complex of 112 exclusive 2 and 3-bedroom residences with the highest quality elegant finishes, each with a garage parking space and storage room, at the heart of Estepona and just 20 minutes from Marbella and Sotogrande. Outstanding luxury complex offering this 3-bedroom apartment with the highest quality elegant finishes, a garage parking space and storage room, at the heart of Estepona and just 20 minutes from Marbella and Sotogrande. 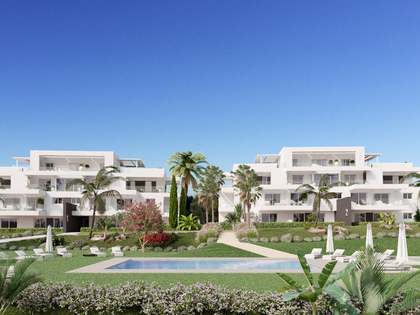 This brand new 116 m² apartment with a 21 m² private terrace is found in an exceptional new development in Estepona, just 375 metres from the sea. The building, by the prestigious architect, Ismael Mérida, boasts beautiful elegant design and premium class facilities including a rooftop infinity pool and terrace with breathtaking sea views, social club, gourmet room, and a communal garden on the ground floor with children's play areas; all of this just a couple of minutes on foot from Blue Flag Mediterranean beaches. This bright, airy apartment has an open plan living room – dining room and kitchen with access to the terrace. The master bedroom has an en-suite bathroom and there are 2 more bedrooms that share a complete bathroom. From the impeccable bathrooms with Duravit bathtubs and heated towel rail to the high quality flooring and fully equipped modern kitchen with Silestone worktops and Balay appliances and solar powered hot water system, this energy efficient, eco-friendly home boasts every imaginable luxury detail. Hot and cold air conditioning, thermal and acoustic insulation make this property peaceful and a comfortable temperature all year round. This is an excellent chance to purchase a private home in what is set to be one of Estepona's most emblematic buildings. Completion is scheduled for the first quarter of 2020. 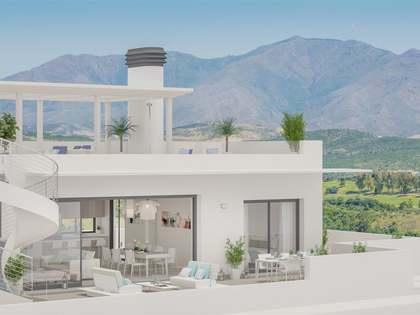 This new development occupies an unbeatable location in the centre of Estepona, just 375 metres from the sea and close to both Sotogrande and Marbella. It is found on the main thoroughfare of the town, close to the Gran Boulevard and all of the necessary services such as shops, restaurants, sports facilities and public transport.